Police are believed to be investigating an image that has surfaced allegedly of a burglar who was part of the break in at Brendan Rodgers’ home this week. The Leicester City boss left Celtic to return to the Premier League this month, but was met with a backlash after ending his spell with the Scottish giants. That went too far this week as his home in Scotland was broken into during the night, with his partner and step-daughter in the house at the time. However, there could now be a breakthrough in finding and arresting those guilty of the raid, as The Sun have published an image seemingly showing one of the burglar’s taking a selfie outside the home, as seen on their front-page on Saturday. 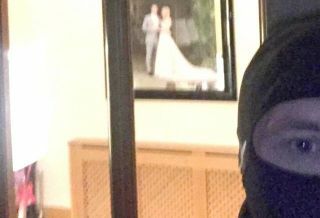 A photo of Rodgers and wife Charlotte can be seen on the wall in the background, and so police are expected to examine it carefully in their attempts to find those responsible. It will undoubtedly prove difficult given the male in the photo is wearing a balaclava, while they will of course analyse all the evidence to ensure that it is a genuine line of enquiry. Charlotte and Lola, 6, reportedly locked themselves in the bathroom during the ordeal, with Rodgers losing many of his medals that he has won during his stint with Celtic.